Today in a box I came across my old K&R. 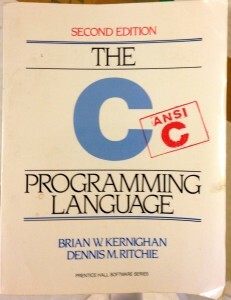 Probably the most valuable book I've owned. My copy has been heavily used. But the unexpected, fun thing was finding an old label on the back cover. January 1994. I had just graduated college, driven cross country with my friend Shig, and started my first post-college job. I would have been in that job four months or so and realized that I should just stop borrowing someone else's copy (probably Larry Claman's) and buy my own. Purchased at Quantum Books, a great technical bookstore in the shadow of MIT in Cambridge, Massachusetts. It's no longer there. The bar that is there now (Meadhall) is a nice place, and I'm a big fan of beer, but it's not the same. According to an inflation calculator, $35 in 1994 is $55 today. That's expensive for a little book, especially to the twenty-two year old me. It was fun being reminded of all this stuff. So the lesson of the story: it's still worth buying books, and when you do, don't remove the labels.